Are you ready to step-up your french fry game? 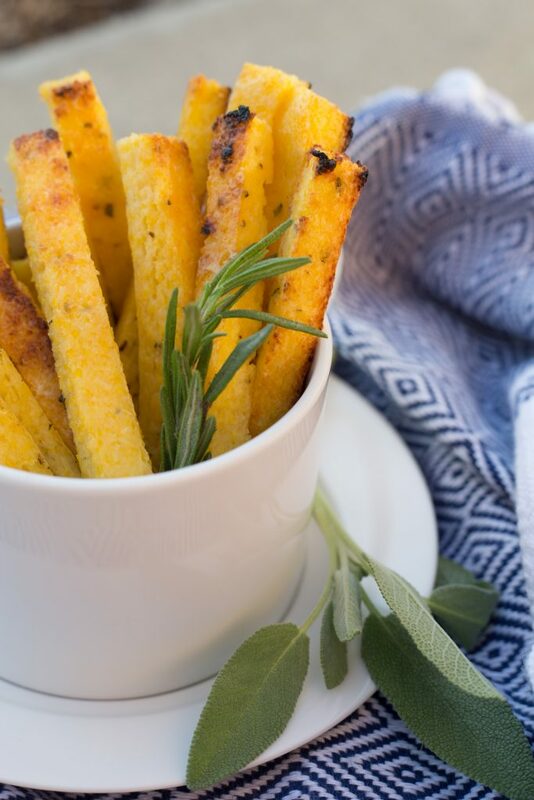 These flavorful vegan polenta fries are a must-try. They’re from The Friendly Vegan Cookbook by yours truly (Michelle Cehn) and Toni Okamoto (founder of Plant Based on a Budget). Don’t worry, there’s no deep fryer necessary! Just pop ’em in the oven and get ready to wow your friends with this unique side dish. Grease a 9-inch by 13-inch baking dish. Combine water, polenta, herbs, and salt in a saucepan and bring to boil over medium heat while stirring. Reduce heat to medium-low and cook, continuously stirring for 15 minutes. Remove from heat and stir in the vegan cheese and butter. Pour hot polenta mixture into your greased baking dish and spread evenly, flattening it into the dish using a spatula. Refrigerate for 30 minutes. Preheat broiler. Pop the chilled polenta onto a cutting board and cut into 4-inch long french fry shaped spears. Place on a greased baking sheet and brush with olive oil. Broil about 4 inches from heat until golden—about 15 minutes. Watch it like a hawk and pull your polenta fries out the moment they start to brown. Tip: Like most fries, these lose their pizzaz after being refrigerated, so plan to enjoy them right out of the oven! Hungry for more vegan polenta recipes? Try these plant-based polenta pizza bites and this creamy berry polenta breakfast!